Recommendation: Choose a microphone with low sensitivity instead of using the RA0016. The GRAS RA0016 is a 20 dB attenuator for inserting between a 1/2" microphone and preamplifier. It will attenuate the output signal of the microphone by 20 dB in order to avoid overloading the preamplifier. The RA0016 is useful when measuring very high sound pressure levels using a preamplifier with limited dynamic range. The RA0016 will work properly only with externally polarized microphones. 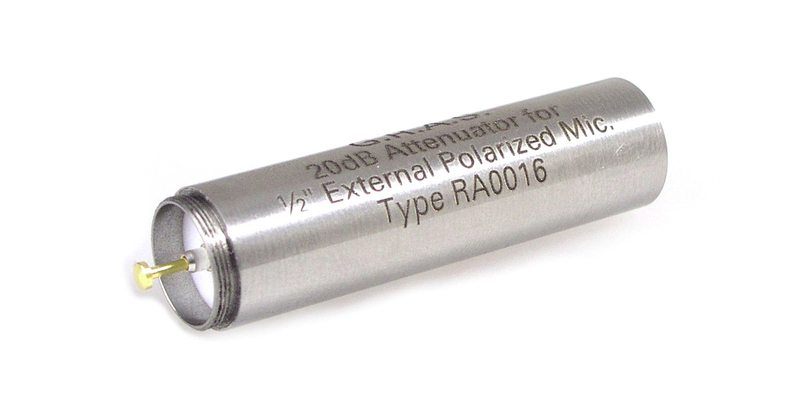 For prepolarized microphones, use the RA0018. For precision measurements, the actual combination of microphone, attenuator and preamplifier should be calibrated with a precision calibrator like GRAS 42AA Pistonphone. The attenuation of the microphone signal is obtained by a capacitive voltage divider, and depends on both the microphone capacity and the preamplifier input impedance. The attenuation has been adjusted to 20 dB with a microphone with 20 pF capacity and with a typical GRAS preamplifier.